Oh my… January is THE month for organizing isn’t it? I mean you must feel the social-media urge to do something organizational and formatable in the month of January, do you not? I totally succumb to the “get your house in order” influence at least once a year and I’d be dishonest if I didn’t say it wasn’t a good practice! This new year I’ve teamed up with Kirklands in their “Resolution: Organize” event along with a few of my girlfriends to help motivate and get each other more organized in simple and realistic ways. 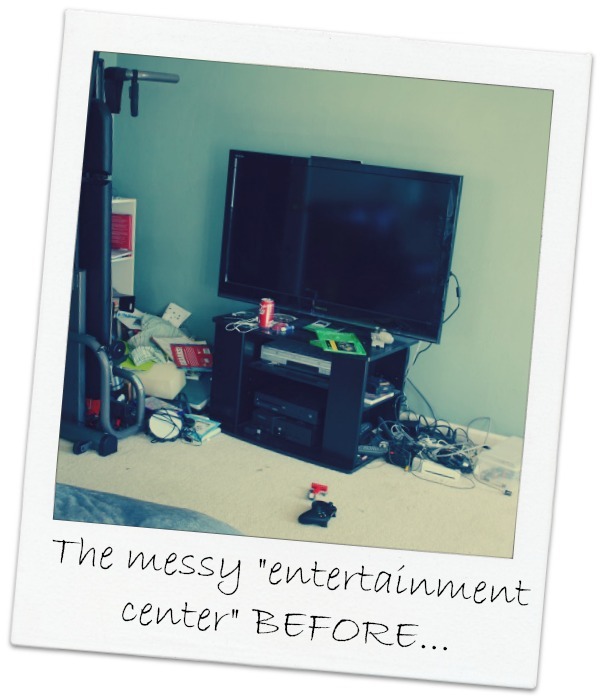 As you know I’ve recently been working on organizing our playroom, which also functions as our media room. We installed custom built-in bookshelves and started making the room a fabulous specimen of toy, truck, and actions hero order of its kind! Take a look at the stages of the playroom below. But I had one little secret that I kept hidden from all of blogidom…. Let me introduce you to…. THE CORNER OF SHAME…. Oh my, it was a hot mess! A hot mess of chaos, of cords so tangled and entwined, like cooked spaghetti noodles that had sat out way too long the stovetop, lending no rhyme or reason as to what in the world they actually went to. It was a hidden corner, yet one that was used most often. It hosted the TV… the um, entertainment zone. Time to get organized! 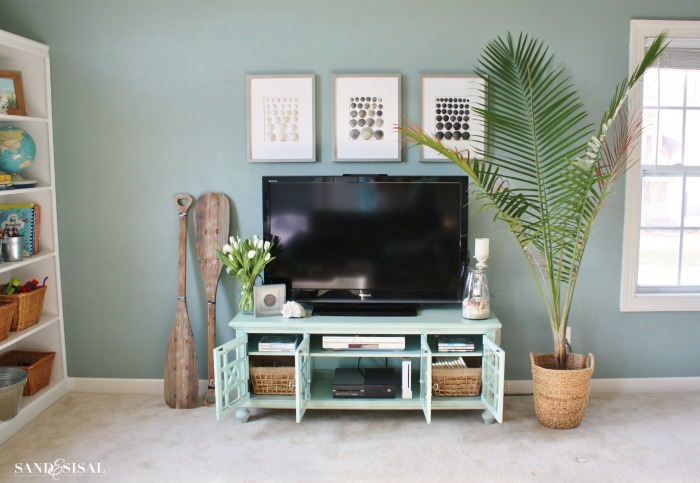 We were in desperate need of some entertainment center organization… and pronto! The time had come for a new entertainment console, one that actually fit the TV this time. I was thrilled to find this beautiful robin’s egg blue media console from Kirkland’s with glass door fronts and silver hardware. It came fully assembled (yay!) and had enough storage for the kids’ games. The decision to get organized is never a simple one, but I do find a few tips that always make the process more tangible. #1) PURGE & DONATE– Gather all your old game consoles, video games, movies (VHS, DVD, Blue-Ray) and decide what you really want to keep. Donate everything you don’t want or consider re-selling the items to a video store. Most national video game stores will purchase your used games, controllers, and units. I asked my sons gathered all their old Xbox games, decide what they really wanted and then traded them in toward a purchase for a new game console. We immediately eliminated over 1/2 of the clutter. 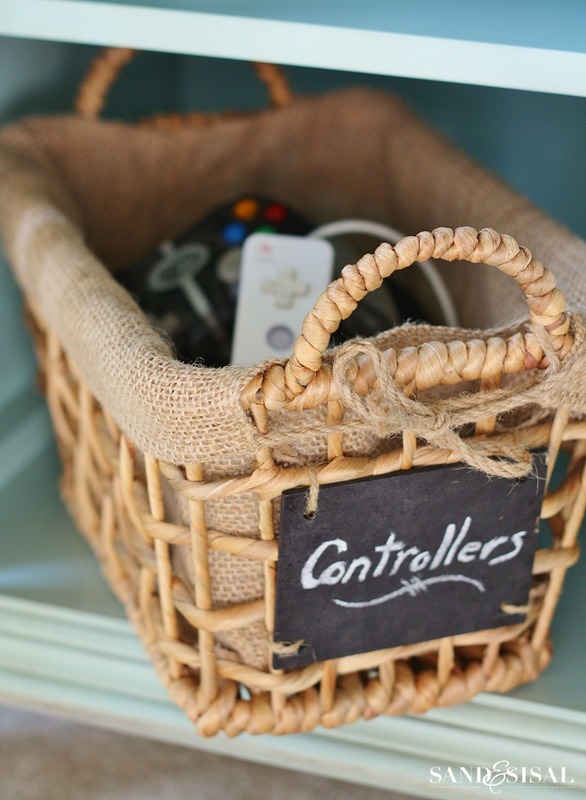 #2) CREATIVE CONTAINERS – Now that you have purged and donated your older items, place your games and controllers in your entertainment console in stylish and simple baskets. I love using woven seagrass baskets like these I found at Kirklands. Click the link to check out all the other creative containers and playroom storage ideas I’ve used in this room. These cute hyacinth and burlap baskets come with a convenient chalkboard tag to label yourself. 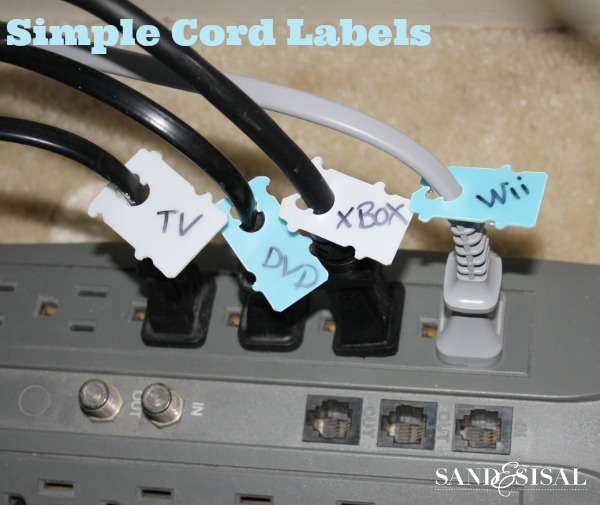 #3) CONTROL THE CORDS – Say buh-bye to that scrambled tangled mess of cords behind he console with inexpensive zip ties and plastic bread package closures! Upcycle the plastic tabs that help close your loaves of bread and lable them with the names of of your cords. Now you will never have to guess which cable goes where. 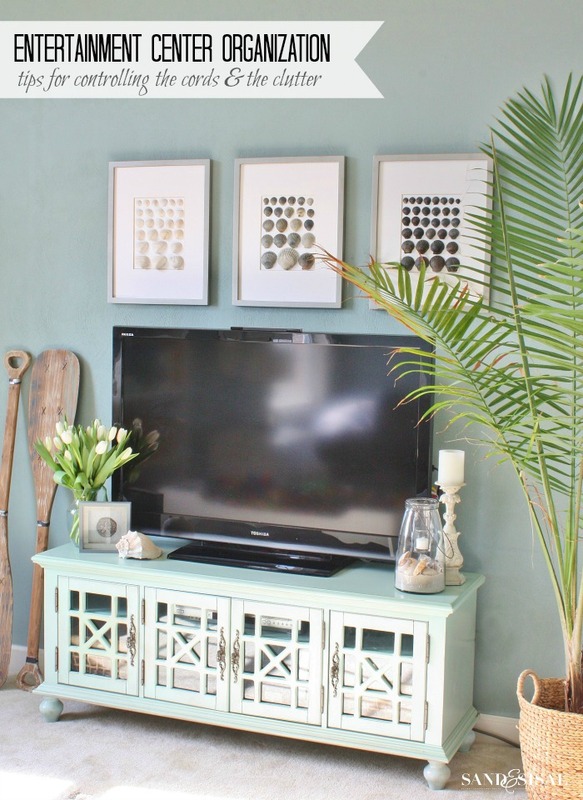 #4) Accessorize – Everything should look pretty, even a big screen TV! Personalize your entertainment console and that huge black TV with some beautiful accessories on the sides and artwork above. 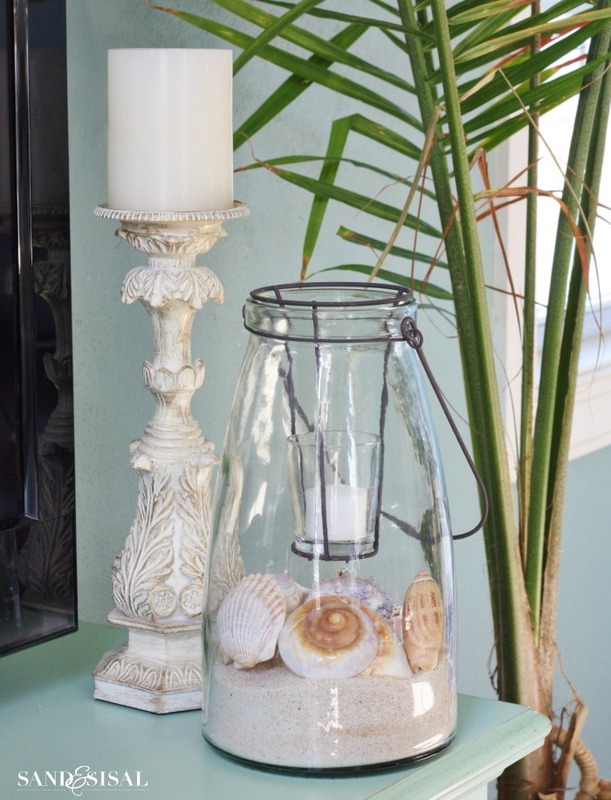 I chose a pretty white candle stick and glass lantern filled with sand and shells…. 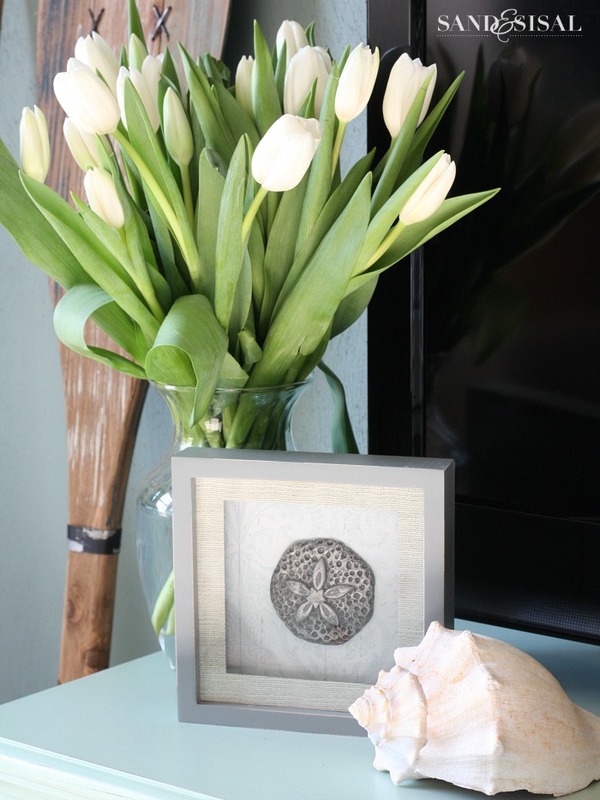 rustic wood oars, a vase of my favorite, white tulips…. Ahhhh, don’t tulips just make you smile, especially in winter? and a sand dollar shadow box. We placed the entertainment console on the opposite side of the room and adjusted the seating for better viewing. We are all so happy how organized and functional this playroom/entertainment room has become! Kirkland’s wants to help you get organized this new year too with a $100 Gift Card Giveaway to their store! Click HERE to find a Kirkland’s store near you. Enter for your chance to win in the Rafflecopter entryform below. And check out how my girlfriends are getting organized in their home too this week with a little help from Kirklands! I received compensation for the “Resolution: Organize” blog post. Kirkland’s partnered with several bloggers like me to raise brand awareness. All purchases and content are of my own accord and reflect my personal opinion and style. Looks so fresh and clean! 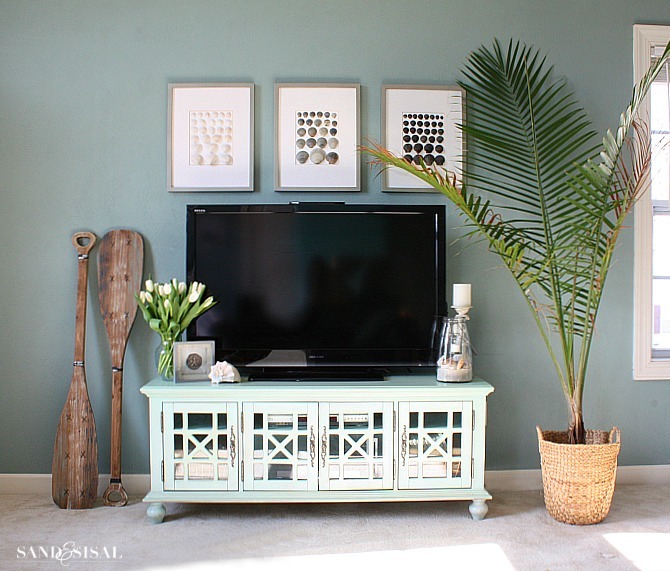 I love the framed shells above the tv – are they a diy? I am in desperate need for wall art so that is what I would purchase!! Love the entertainment center. I think that would work well in my home also. I’m redecorating my bedroom so I would purchase nightstands. Kirkland would not have entered my mind for nightstands if I wouldn’t have seen this blog. Thanks! This looks so pretty and organized. Thanks for the opportunity! Great post! I will definitely try the bread label idea genius!! Love this store, I would buy the Infinity Frameless Wall Mirror, so pretty. I want that Classic Charm Beverage Dispenser!! Makes me want to update and refresh my home. Love the pictures! Baskets to store and hide! I love the media console! The room looks amazing. I could really use some nice storage baskets. I LOVE the transformation from before and after, you are a genius!! Gives me many ideas for my own home. We just got a new 46″ TV Friday & it won’t fit in our armoire! We have been looking for an entertainment center. This is perfect!! I forgot to say we would purchase the beautiful blue Kirkland’s media console with the Kirkland’s $100 gift card! Your playroom makeover is absolutely beautiful! I love the built in cases, especially with the addition of the storage window-seat. And I LOVE those rustic wood oars! Would love to have something like that in our house. Keep up the great inspiration! Love that entertainment console! The detail is excellent! I love their curtains. The beige trellis ones are my favorite. I love your room and all my favorite color! 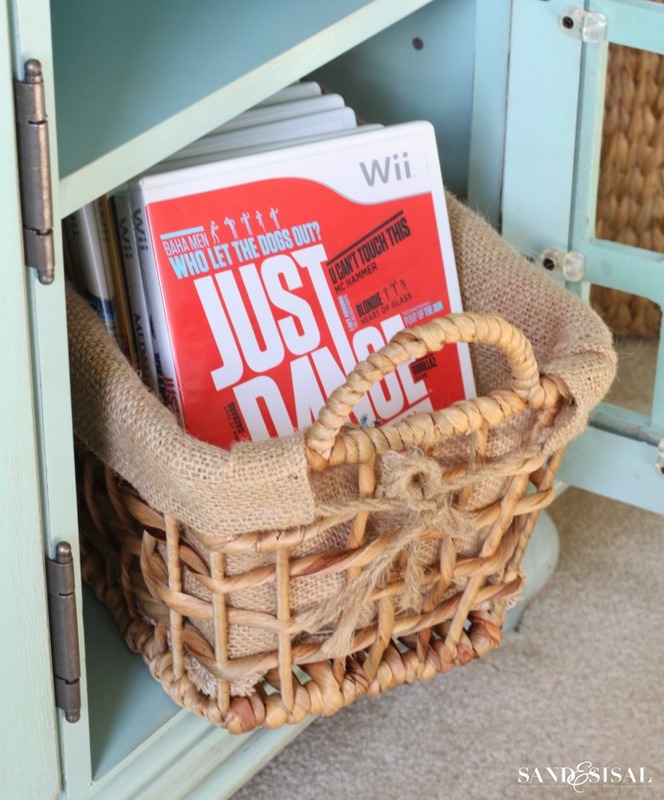 I think I would buy some of those cute baskets to start my organization! AWESOME giveaway! Thanks so much for the chance! I’ll get Cheval Jewelry Armoire Mirror. I’d buy everything that’s been in my cart for like a month! I LOVE Kirkland’s!! We just purchased a house and there are so many thing I want from Kirklands. A large wall mirror, lamps, curtains, decor, etc. etc. etc. Ha! I so understand! Thanks for the sweet comment Tanya! I would use this gift card from Kirkland’s to decorate our new downsized home! THank you! I love the lantern with seashells in it. I want one (or several) of those. We’ve finally finished building and moving into our new home. I’m looking for the perfect chest for my entry way. But I love shopping at kirklands! I would get some curtain panels. I need some for my living room! I would like to get some curtains and wall art for my living room. I would use it toward the Black Butterfly Metal Patio Chair for my garden. 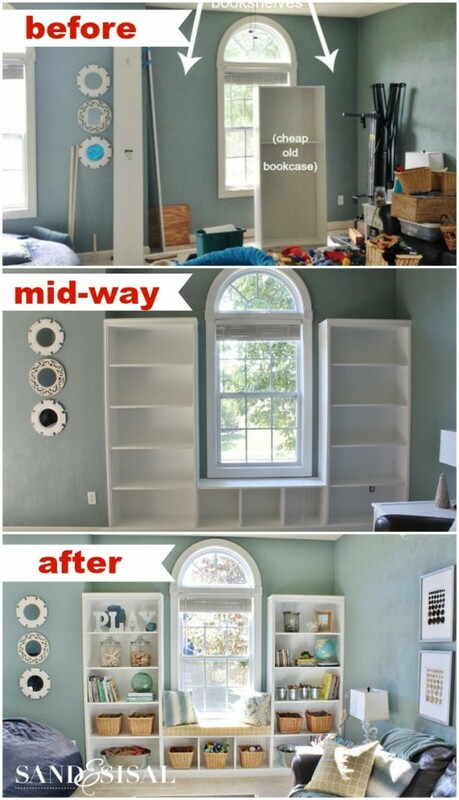 I’d buy a mirror for my daughter’s room that we’re in process of re-doing, then maybe some storage for my craft space. I’d love two of the Midnight Black Accent Chairs for my entry way. They are gorgeous. The Distressed White Fleur-de-lis Mirror would look amazing in my living room. Thank you for hosting this fabulous giveaway! I love Kirklands! I would buy a new area rug! I would get some items to decorate our formal living room which definitely needs some new things. I love your plastic bread tie idea with power cords. It’s genius. I would get some tasteful decorations for the living room. Love the makeover of your playroom. I would purchase a pair of new lamps for the master bedroom. Kirkland’s has great lamps! Love that the kids can keep their toys out on the “coffee table.” So practical! I would use the gift card towards purchasing the Madison Floor lamp for my bedroom, love the style! I need curtains. We have been in our house for 2 years and we have no curtains in our great room, dining room or breakfast room. This $100 would go a long way in getting us started. You LOVE Kirklands! I meant to say I Love Kirklands! We could definitely use a new entertainment center! I would purchase a couple of the farmhouse mixing bowls, and a comfy throw. Thanks for the great giveaway! We need storage for our sons playroom. Or decor for the family. Pretty or functional… I hate hard decisions!! I would get some small baskets for a cabinet I just got. Thanks for the giveaway! Wow!! It looks amazing! Definitely some major inspiration. Would love to win the giftcard to get some awesome home decor. I need some baskets for organization. Maybe some curtains for our living room. I would pick up some new artwork for my walls! What a great room, must pass this post along to married with kids daughter! I’d love to get the Glossy Bronze Floor Lamp. 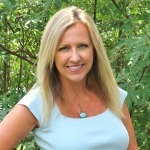 I love your blog and I love Kirkland! I love all your beachy/coastal decor ideas! I wish my house was as beautiful as yours! I need new furniture. so I’d buy the Harrison Blue Stripe Arm Chair if I won. Do I ever need some fresh new furniture and organization for my livingroom redo! i’d get Mirrored Leaves Canvas Art Print. We need some kind of artwork to hang above our tv and a new rug in our hallway! The bread closures are a great idea for labeling cords. I would never have thought of that. Love the room! I am totally crushing on that media console you got!! 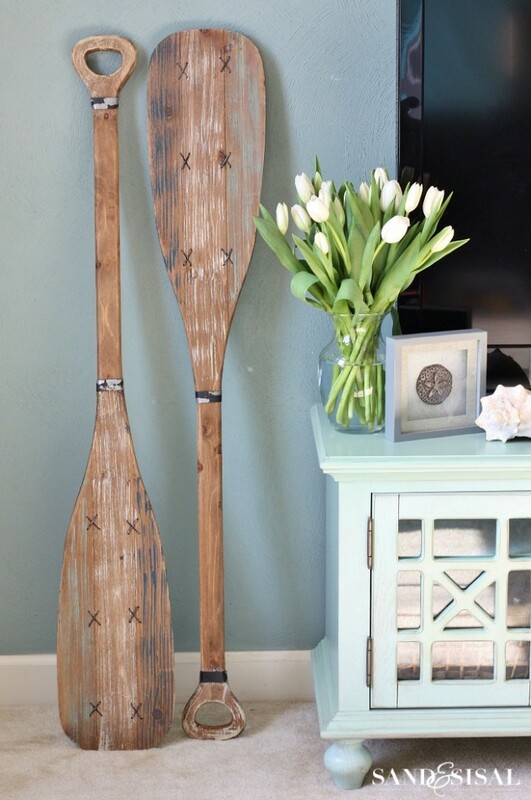 And those cute decor oars! I would most definitely purchase beachy decor at Kirklands! I like the distressed sage gray scalloped chest. Love the room and all the great, fresh ideas! I’d buy lamps or nightstands for the master bedroom since it’s the room we’re currently working on, but love so much at Kirkland’s! Thank you for hosting this very generous giveaway! I would buy some new pictures for my walls. I need to update some of my wall hangings. Oh I really love the Black Beadboard 4-Drawer Storage Chest! That would be perfect to help us organize! I like the Tahiti Brown Cane Writing Desk. I’d buy a really pretty lamp. They have too many to choose from! Lanterns and Candles! I so hope I win this, my décor is sad looking lately! Thanks for the chance! I would love to have some new lamps for my bedroom! I would shop for table accessories – what a great giveaway! I would get some new pillows for our basement family room! I liked the burlap lined basket. Your room makeover looks great! I need new pillows and I see a great variety on the Kirklands website. I really like the Nora Gray King Headboard. I am in need for a new change of my decorating for my living room walls. What color did you use for your walls? I really love it. Thank you! It is Atmospheric by Benjamin Moore.